Another Mississippi cruise idea is floated, but will it stay afloat? Guilford, Conn.-based American Cruise Lines says it will be offering week-long cruises on the Mississippi, Ohio, and Cumberland rivers, starting in August 2012. Six itineraries on the schedule would have Memphis as an end point. Prices for a seven-night trip range from $3,595 (single) to $6,285. A schedule announcement and a web page doesn't guarantee that the cruises will actually happen. Earlier this year, Seattle-based Cruise West had said they would offer Mississippi cruises starting next spring, but that company has since suspended operations and shut down. As on all true riverboats, a stage and bow ramp will give the ship access to the many interesting ports without docking facilities. Real Mississippi riverboats are designed to load/unload passengers and cargo at sloped landings along the river's edge -- like our historic cobblestones, and the landing right across the harbor on Mud Island. The slope of these landings could easily accommodate the great fluctuations in the river's level. So, contrary to what the RDC has implied in their marketing, Beale Street Landing wasn't really needed. We have a perfectly good, authentic riverboat landing for the large boats, and the historic cobblestone landing for smaller ones. 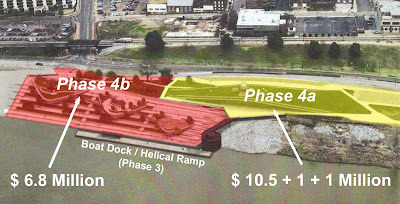 Instead of budgeting over $37 million for a new dock, we could have spent a fraction of that upgrading the Mud Island facility, already used by the large boats, and rehabilitating the historic cobblestones for all other boating uses as was originally promised by the RDC. For more, see this Commercial Appeal story. A cruise company's troubles have cast doubt on plans to bring overnight cruises on the Mississippi River back to Memphis next year. The small-ship cruise line Cruise West announced it had suspended new bookings while the company is restructured. Cruise West posted a statement on its website that said it would continue to operate its U.S. flagships through October, but it gave no information about future offerings. It said company executives would not respond to questions from the media. The shutdown came less than three months after the Seattle-based company said it would launch cruises on the Mississippi stopping in Memphis starting next March. In June the company began accepting advance bookings for two seven-day itineraries for the 102-passenger Spirit of America: New Orleans to Memphis and Memphis to Nashville. The New Orleans-Memphis cruise was touted as spotlighting plantations, mansions and Civil War sites of the iconic South. The Memphis-Nashville cruise was to focus on the music heritage of destination cities. Prices started at $3,499 a person. Memphis hasn't had overnight cruises since the Delta Queen stopped running in October 2008. The Memphis Riverfront Development Corp. has a new docking facility under construction at the foot of Beale Street, but it won't be completed until late next year. Cruise West said the first step in its restructuring was terminating its "Voyages of the Great Explorers" cruise when the Spirit of Oceanus docked in St. John's, Newfoundland, on Wednesday. "Additional assets may be sold and other steps are being pursued toward a restructure," the statement added. Below is the full text of my own remarks before the City Council last night. On Tuesday night the City Council voted to appropriate the $10.5 million to build a restaurant and gift shop at Beale Street Landing. There were three NO votes (Shea Flinn, Reid Hedgepeth, Kemp Conrad) and one abstention (Wanda Halbert). Opposition observers saw Conrad's vote as surprising and courageous, since he has been an RDC board member and supporter. Though they ended up voting YES, several other council members seemed to be troubled and struggling with their decisions. Two of them, Jim Strickland and William C. Boyd, grilled Benny Lendermon at length on his claim that if the City didn't proceed with the project, it would forfeit $8.9 million of Federal money and possibly some State money, too. Lendermon admitted that the Federal Transportation Department grants were for building the boat dock (the current Phase 3), but City money is being fronted and the Federal reimbursement needs to be applied for. The boat dock is mainly steel work and is being built off site. But Lendermon seemed to be saying that if the City didn't proceed with Phase 4a (the restaurant), then it would be ineligible to receive the Federal payments on the boat dock. He didn't explain why the Department of Transportation considers a restaurant to be a necessary and essential part of a boat dock. Perhaps it was because no one asked him precisely that question -- and maybe that was his good fortune. Myron Lowery, a YES vote, made a showy point of telling everyone that he was always in the loop on RDC's budget woes, even though Benny Lendermon had just told the CIP Budget Committee the opposite. (Continued from part 1.) Tomorrow, the City Council is being asked to spend $11.5 million of taxpayer money to build a restaurant (and gift shop) business. When you strip away the hype and the bullying (and a boat dock we didn't need but are now stuck with) -- that's the essence of it. Many might question, just on principle, the idea of taxpayer-funding and risk-taking for a restaurant business. But I think there are some serious business plan issues, not the least of which is this: There is no operator attached to this project. RDC Chairman John Stokes: It's my way or the highway. STOKES: Because if we don't get the two [million dollars], we're stuck with the way it looks now. And dadgum it, that's going to be on the conscience, in my opinion, of the Council members that vote NO. I'm just telling you that, because it's gonna be there forever till somebody... And we're not gonna do it. Click here to listen to the 22-seconds of MP3 audio. Sound like a threat to you? It certainly does to me. But threat or not, it's supremely arrogant. It's all part of a cynical deceit that the RDC apparently plans to use with the City Council this Tuesday. They want us all to believe that we have only two choices: (1) Build BSL completely, as designed; or (2) suffer with the big hole and scarred landscape -- a mess that the RDC itself created. This is a falsehood, of course. There has always been a third choice: Spend a more modest amount of money -- $1-2 million -- to fill the hole and re-landscape the undeveloped area. But the RDC officials don't want anyone -- not even their own board -- to seriously consider the third option. BSL's current design with 3 pods. For several weeks, the RDC has been quietly spreading this strawman argument, indirectly, via friendly bloggers ("If Beale Street Landing is halted...Tom Lee Park and the Cobblestones will forever be separated by a crater") and their supporters' letters to the editor. This past Wednesday, the RDC held a board meeting to pre-test and polish their strategy for getting a $10.5 million dollar authorization from the City Council (which a Council committee has already recommended against) this coming Tuesday. It seems that a picture of the unfinished mess at Beale Street Landing will take center stage. Lendermon has the current 3-pod design on the boardroom video screen, explaining that the $10.5 million will pay for the restaurant building, gift shop and restrooms. Even if that money is approved, he explains, $6.8M has yet to be found for the final phase -- the park area, or what observers often call "the pods". Presumably to show this, Lendermon flips to a slide (shown below) that's missing the pods and terraces -- with the scarred and ugly dirtscape where the park would be. The ugly picture with Phase 4(b) missing -- and nothing done to clean up the mess. At this point, a board member tries to ask a rather obvious question: What happens if they don't get the money to do the park? Do they really intend to leave that area scarred and unfinished, or are they going to clean it up. Lendermon won't answer her question. He keeps talking as if it's all or nothing choice. John Stokes jumps in and claims that the there's no point in talking about it, because the 6.8 million will be found. The board member tries again and again to get a straight answer to her question. STOKES: [The point is] what are we going to do now? ...and again, if they vote it down, who's going to fill up that hole that's there now? We're not. I told Benny I'm outa [here]. I'm not going to go back and...and fill that hole up. STOKES: You don't really...want for this part on the left [the pods-Phase 4(b)] to look great right now. You don't want it to. Because then it stops the project. They plan to scare the Council (as they've already done with the general public) by presenting a stark, binary, and false choice: It's got to be our way...or a hole in the ground. RDC knew for over a year and kept Mayor Lowery in the dark. After over 150 years of continuous, thriving use, the City of Memphis plans to decommission our Cobblestone Landing. Tourists and Memphians might never again see those majestic riverboats docked at the foot of the Cobblestones - much less board a boat there to take a scenic Mississippi river cruise. When did the riverfront strategy veer off course? What was RDC's big predicament by the end of 2005? Why are some Memphians afraid of our heritage (while other cites aren't)? Why does the City want to put its Cobbles "under glass"? What did the Master Plan actually say about the Cobblestones? Why would the City want to decommission the Cobblestone Landing? Does the RDC plan really allow "continuation of boat docking" there? Will Beale Street Landing be named after Willie Herenton? Don't we need a new riverboat landing? Do the Cobblestones really need to be made ADA compliant? What was the "Memphis Elevator?" Does the RDC actually know the Cobblestone Landing's history? What was the "Garrow Report" and why was it produced? The question not asked about BSL: Is there a security plan? This is a personal blog site. Opinions expressed are solely those of the site's author and editor, who is a private citizen not affiliated with any riverboat company. This is a personal blog site. Opinions expressed are solely those of the site's author and editor, who is not affiliated with any riverboat company.